Since first being awarded in 1901, most Nobel Prizes for science have gone to the USA, the United Kingdom, Germany and France. 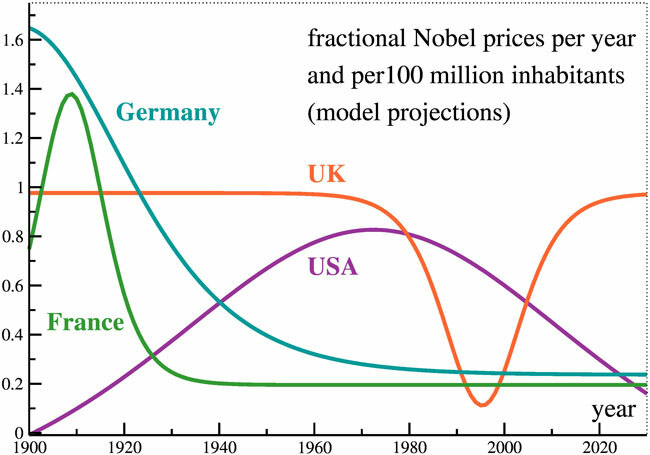 An empirical study by Professor Claudius Gros from the Institute for Theoretical Physics at the Goethe University in Frankfurt has now shown that the Nobel Prize productivity in these countries is primarily determined by two factors: a long-term success rate, and periods during which each country has been able to win an especially large number of Nobel Prizes. “National research advancement can undoubtedly also be successful independent of Nobel Prize productivity,“ Claudius Gros stresses. “Especially because new areas of research such as the computer sciences – a typical US domain – are not included.” It therefore remains open whether the decline in Nobel Prize productivity is cause for concern, or merely an expression of a new orientation toward more promising research fields.